The list of Southwest Virginia’s recent economic announcements compiled by the Virginia Economic Development Partnership is a picture of diversified development. Automotive steering components, natural flavorings, meat processing, woodworking — the region is developing and expanding a variety of industries. According to Gov. Terry McAuliffe’s office, Virginia competed with Georgia, Kansas and South Carolina to get the call center, which may answer your questions if you have trouble e-filing your taxes this year. 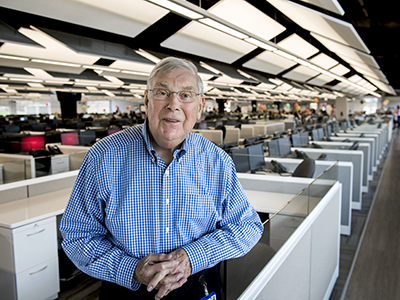 The call center handles “Quickbook and TurboTax and things of that nature,” Snodgrass says. McAuliffe called the project “a testament to the strong workforce, business climate and strategic investment potential in this region,” and the rest of the state. According to the VEDP tally, Frontier invested no money upfront. Snodgrass says that’s right, except for bringing in some equipment. “We got some grant monies to help with the project,” he says, that require Frontier meet performance promises, such as creating all those jobs. But most of the work and money that went into preparing Frontier’s new facility came from local and state government. The Virginia Coalfield Economic Development Authority approved a $5.6 million loan to the Wise County Industrial Development Authority for the deal. The Virginia Tobacco Region Revitalization Commission approved $2 million in Tobacco Region Opportunity Funds. Virginia Jobs Investment Program helps with training, and other state funds are potentially available for the project. The county’s Industrial Development Authority took care of transforming a shell building in the county’s industrial park. Frontier moved in last August. The IDA still owns the building and leases it to Frontier. In December, the county’s unemployment rate was 7.6 percent — at a time when the state figure was 4.1 percent. “These jobs, obviously, don’t pay the pay scale that the coal miners earned,” Snodgrass says. Still, these jobs pay pretty well — about $35,000 a year with benefits, Snodgrass says. That’s about $300 more than the national median annual salary at a call center in 2015, according to the Bureau of Labor Statistics. Two counties to the north, in Buchanan County, a call center faced a different situation. Administrator Craig Horn says the Sykes call center was able to retain 100 jobs that could have been lost. Sykes had been handling customer service for Bank of America and MetLife, Horn says, but lost those contracts. Sykes expected to close the call center, then changed course when it got another contract. In December, the unemployment rate in Buchanan County was 8.9 percent — 4.8 points higher than Virginia’s rate. Horn says that, because of the county’s population, it is unlikely to land another call center. The company promotes the site as remote but not inaccessible, calling Wise County “The Safest Place on Earth.” DP Facilities says the county will “insulate the facility from natural disasters, blackouts and attacks on large population centers.” Nonetheless, it is located near a private airport. The center’s 30 jobs include armed security personnel, who are on duty around the clock. The pre-cast concrete building is protected by anti-ram fencing and other barriers, a perimeter blast berm and extensive video and counter-surveillance systems. The company boasts of State Department-certified barriers and Defense Department-approved anti-terrorism standards. Access is controlled by biometric and key card systems.